Just felt like saying that today. This may help you...it sure helped me. I was thinking about Proverbs 3:5-6 last night and decided to do a search on Google, looking for some commentary on those two verses. I found an audio message that really spoke to me on this web page. The message was given by a minister named Brian Myers at Grace Church in Roseville, Minnesota, several years ago. I don't know who the guy is (or anything about the church), but his message sure hit the spot. If you're in a season in which you're wondering what God is up to you in your life, and have a few minutes, give it a listen. 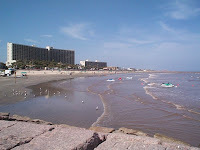 It was a nice day in South Texas so I decided to come down to Galveston Island this afternoon. I figured I'd just drive up and down the seawall, grab something to eat and look at the places I used to see everyday. It turned out to be extremely warm. I haven't spent a whole lot of time outside air conditioning, but the beaches along the seawall seem to have folks braving the heat. I don't get down to the island much anymore. I always remember what a Galveston reporter once said to me: "People come down to this island with $20 in their pocket and the shirt on their back, and they don't change either while they're here." Well, I could probably wear this shirt for a few days if I wanted to, but I'm not leaving here today without some of that Gulf shrimp. I'm breaking this twenty. I've stopped in a little local seafood place I used to eat at occasionally when I was a resident. I'm looking out the window here at the Gulf. 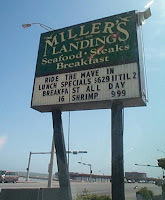 They have this 16 shrimp deal they've advertised on the sign for a long time. When I lived here it seemed it was a couple dollars cheaper, but I'm not complaining. It's tasty. I came down to Galveston primarily to walk out on the jetty I told you about earlier, and I just did that. Remember the jetty I talked about in the earlier post, back in March of last year? The one where I talked to God about my Princess? I walked out on it again today, maybe just to keep the whole thing fresh in my mind. Someday I plan to bring my Princess out here and walk out to the end of that very jetty with her. Maybe we'll talk to Jesus together from that very spot. Until that day, I took some photos. This picture is looking toward Seawall Boulevard from the rocks. I drove down to my old condo on the seawall, just to see the area again. I enjoyed living there. They've painted the complex a different color, and it's named something different now. Living on the seawall in those days was the life! When the weather was cool (unlike right now), I could leave my sliding door open, and sleep with the sound of waves crashing to the shore. Sometimes when I'd wake up early in the morning, I'd climb down the stairwell to the beach and spend my morning quiet time watching the sun come up over the water. There is something about spending time with God on the beach. The seawall area is growing and changing. The Balinese Room looks like its had some work done. That place has some history. Every time I see it now I think of a disgruntled former Astros pitcher with one arm throwing Roy Scheider through a glass window in the back. Don't look it up, it wasn't a family film, and it was very silly. Speaking of the Balinese, they need to book this guy ASAP! He sounds just like the real thing.